This one is canonical, but much like the 1985 copy of The Adventures of Sherlock Holmes, which I shared here, I love how this 2011 BBC Books edition of Doyle's first Holmes adventure, A Study In Scarlet, uses the reigning Holmes and Watson on the cover. In this case it's Benedict Cumberbatch and Martin Freeman from the hugely popular television series, Sherlock. The hit BBC series Sherlock has introduced a new generation of fans to Sir Arthur Conon Doyle's legendary detective. 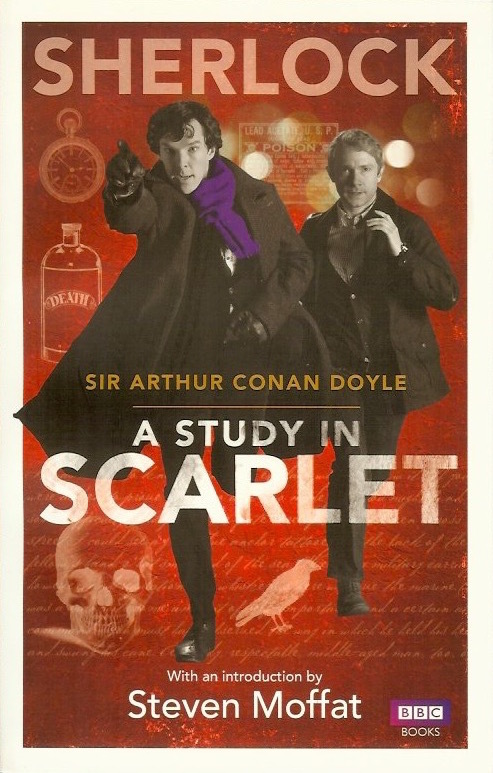 The debate episode took as its inspiration Conan Doyle's first Holmes novel, and this new edition of A Study in Scarlet, with an introduction by Sherlock co-creator Steven Moffat, allows fans to discover how it all started. A Study in Scarlet is a potent mix of murder, suspense, cryptic clues, red herrings and revenge. It introduces us to the world-famous characters of Sherlock Holmes, Dr. Watson and Inspector Lestrade as they join forces for the first time to track a mysterious killer that stalks London's streets.